included in some way with their final artwork, adding meaning to their piece. Development of artistic processes and techniques to explore visual conventions through form and texture to create artwork. Air-drying modelling medium (Papermagic used for shared example). Plastic plates to work on, and to store drying artworks. Masking tape and textas, to apply names to plates. Tools to assist modelling, such as bamboo skewers, plastic knives, etc. Discuss with students the notion that there are many ways to define a family. For the shared project examples, the teacher discussed with students how they could decide who they wanted to include in their family artwork, recognising family members as people who were important in some way to them and that these people didn’t necessarily have to live under the same roof. Some students also included animals, such as pets, as family members. Introduce the medium to be used and explain/revise modelling clay qualities and techniques. Demonstrate workspace set-up, modelling techniques, labelling and storing of work. Students create a group of mini-sculptures that represent or symbolise members of their family. 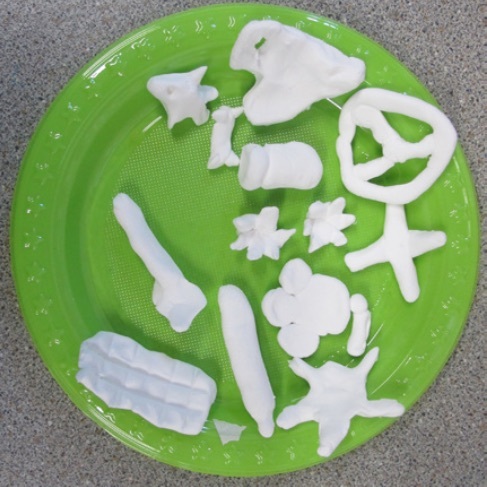 When completed, the mini-sculptures will need to be left to dry on a named plastic plate.